Fireworks shows in and near Tacoma are most common around July 4th, but that is not the only time you can catch these glittering displays. At Cheney Stadium, you can catch fireworks shows all summer long! The Washington State Fair also has firework nights. 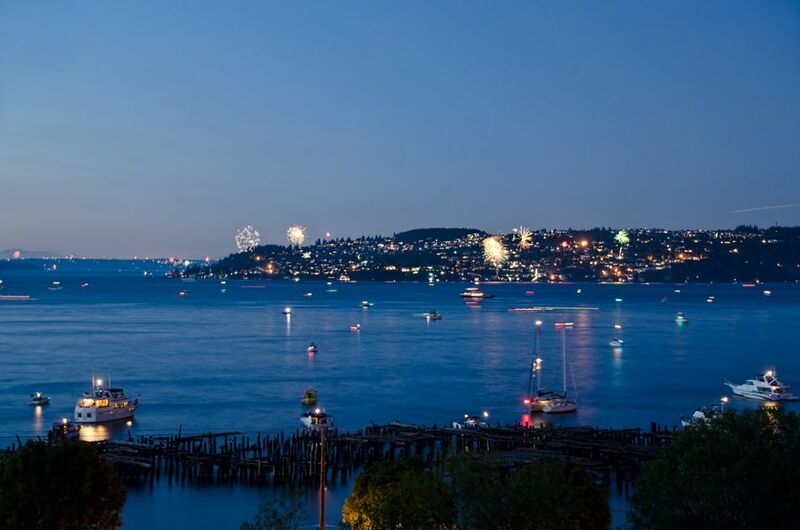 But few things ring in Independence Day like a dazzling fireworks show, and there are shows all over the Puget Sound area on the night of July 4! If you want to see an impressive fireworks show in Tacoma, but it is not July 4th, your best bet is Cheney Stadium. The baseball season at this local stadium goes from April to September. After every home game that takes place on a Friday night, there is a full-blown fireworks show here. Games usually start at 7 p.m. and the fireworks usually start somewhere around 10 p.m., but since the fireworks only start after the game is over, it is not entirely possible to know their exact start time. If you can be flexible, you can actually watch these fireworks from outside of the stadium from the surrounding area for free. Cheney Stadium also usually has fireworks sometime near July 4th, so check their game schedule! There are a number of 4th of July fireworks displays in the Tacoma area, but the biggest and best is the Tacoma Freedom Fair. All day long along the Tacoma Waterfront on July 4th, there's all kinds of food and vendor booths, concerts, shows, a car show and an airshow. After full dark around 10 p.m., the firework show lights up the sky and are set off from a barge in the water. This show has some of the largest and most impressive fireworks around and there aren't any bad seats. So long as you're somewhere on the Waterfront, you'll have a great view. Some people even sit along the streets and hills looking down over the water in the surrounding neighborhoods. Another major place to hang out for the day on July 4th is at Joint Base Lewis McChord’s Freedom Fest. For this event, the base is open to the public and everyone in attendance can enjoy carnival rides, live entertainment, a car show, lots of food and kid’s activities galore—all at Cowan Stadium. The general public must use I-5 Exit 119. Fireworks start at dusk. Steilacoom is a small and adorable city to the southwest of Tacoma. Its streets are quaint and quiet and feel like they may be straight out of another era. For more than 20 years, the city has hosted a July 4th party and fireworks show. Expect family fun, live entertainment, food and more all in Steilacoom's downtown area around Lafayette Street. The festivities are free and this is a great alternative for people who don't want to deal with the massive crowds at Tacoma and Seattle's firework shows. In the past, there have been fireworks shows launched from Lake Tapps, so you can keep an eye out to see if that is on for the current year, but if not, never fear! You can still catch fireworks in Bonney Lake at Bonney Lake Days in late August. Filling Allen Yorke Park with everything from live entertainment and food, to chalk art, vendors and a parade, Bonney Lake Days is a lot of fun. And, of course, there are fireworks at the end of the night. If you live in the southeastern part of Pierce County, driving into Tacoma for fireworks might be unappealing. But Eatonville's July 4th celebrations might just do the trick! Usually starting on July 3 (and fitting in fireworks that night too), Eatonville hosts a day filled with family fun, including bouncy castles, entertainment and vendors all through the day. By night, fireworks fill the sky! The following day, on July 4, the fun continues with a parade and a big picnic! July 4 fireworks take place all throughout Western Washington. Seattle's massive show on Lake Union is the most famous and it's worth seeing if you can find a way to stay in Seattle (unless you enjoy sitting in traffic after your fireworks show). Down in the Olympia area, there are also shows in Olympia and Lacey.